Our Leith Chiropractors Welcome You! Our Leith location, our first, opened in 2004. Located in The Shore part of Edinburgh, this warm and friendly practice is the ideal place to relax and get on the path towards better health. We seek to help you regain your health through relieving pain and enhancing your life. Everything in your body is connected. Your brain is the controller of your nervous system. At Connect Chiropractic, our ethos is to get your nervous system functioning better by improving the health of your spine, which reconnects your brain to your body allowing it to work as it should. Whether you have specific symptoms or want better overall health, we help you connect with your potential. From infants and children to teens, adults and seniors, patients of all ages will receive high-quality, natural chiropractic care at our practice. We also enjoy caring for mums-to-be and helping them experience more comfortable pregnancies. 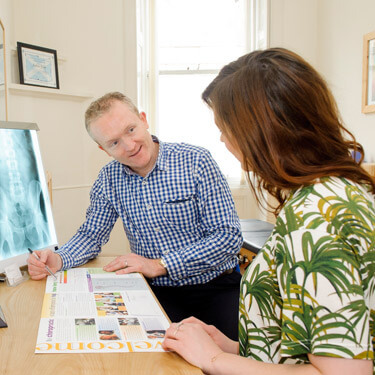 The chiropractic adjustments we use are specific and highly effective, aiming to reduce nervous system interference so you may enjoy better overall health. Our goal is to get the best results for our patients based on whatever they want to achieve. We’ll look at the whole person not just a set of symptoms. Then, we’ll put together a customised plan of action to help you function optimally and experience the best health possible. So if you’re looking for just pain relief, we will work to help you. If you’re seeking care that promotes wellness we can assist in that area too. Perhaps you’ve seen various medical practitioners in the past but were just given prescription medication and no real explanation of what’s going on with your health. We like to provide a different way of promoting better health. Chiropractic is completely natural and doesn’t require drugs or surgery. You won’t receive any confusing diagnoses at our practice; instead, we’ll let you know what’s going on with your body. We pride ourselves on considering the whole patient and jig-sawing together their health concerns to give the best advice and treatment plan. At our practice, you’ll be empowered to improve your health. Contact our friendly practice today to book an appointment!